13.09.2013: BMW Motorrad GoldBet SBK Team Rider Marco Melandri #33 (ITA) riding the BMW S 1000 RR. Istanbul – Free Practice & Qualifying Practice 1. BMW Motorrad GoldBet SBK Team Rider Marco Melandri #33 (ITA) riding the BMW S 1000 RR. Istanbul – Free Practice & Qualifying Practice 1. The first ever Turkish round of the FIM Superbike World Championship started well for the BMW Motorrad GoldBet SBK Team. Factory rider Marco Melandri (ITA) finished second in today’s first qualifying practice at “Intercity Istanbul Park” with his BMW S 1000 RR, qualifying on the provisional front row. His team-mate Chaz Davies (GBR) finished seventh on the provisional third row. For a large part of the session, Marco and Chaz were first and fourth respectively and only dropped back in the closing minutes. 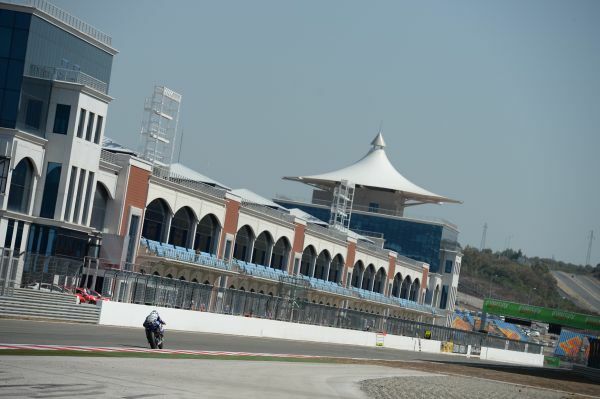 In the morning Free Practice, the session was extended from 45 to 90 minutes to give riders and teams the opportunity to get acquainted with the track, a new addition to the calendar. In this session, Marco and Chaz were also placed second and seventh. Istanbul hosts the 11th round of the 2013 season. “It was quite a good day, even if it was not easy. The conditions were much different to what I remember. The asphalt offered no grip and the white lines were like soap. Maybe this was also because of the hot temperatures. This morning I nearly crashed on turn 2 because the bike was sliding and as many other riders had crashed, I decided not to take unnecessary risks. “Today was not too bad. We made some good changes from this morning to this afternoon. We are struggling a little bit with the lack of grip at the moment but I think that goes for most people. In the early stages of this afternoon’s qualifying my RR felt better than in the morning’s practice and we made some further improvements but then I did not have the best feeling with the tyre I used on the final laps and could not get the best out of it so I did not achieve my best possible lap time. “Both Marco and Chaz have already raced here some years ago, but that goes for quite a few riders who have been here with several series. We cannot speak about a real advantage as the only benefit they have is that they already know the track. Everything else does not go into account as they raced here with different bikes, different tyres and different temperatures as the Grand Prix were held at another time of the year. This morning, the temperature was good for riding while the asphalt offered low grip and this, unfortunately, caused some crashes. In the afternoon, on the contrary, riders had to deal with high temperature but had more grip, because the asphalt was getting better and better. “As we expected on a new race track, we had a lot of work during the day and the extra 45 minutes of practice helped us and the riders to get familiar with this amazing circuit. As usual on a new track, the grip is not fantastic at the beginning and we expect that this will improve practice by practice. This has caused some issues for both riders, especially in the first session. Both started their work with finding grip on the rear and working to set up the suspension for these track conditions. In addition, it was important to learn more about the specific needs in terms of settings of the electronics and the gearbox. Chaz is still not comfortable with the rear grip, especially on the edge and a bit of the traction as well and this is our main focus for tonight. In addition, we will work on the gear ratio selection. Marco was helped by his knowledge of the track so it was a bit easier for him and he is quite happy with the overall performance of his RR. He is already fast on the used tyre and he would like to improve the feeling for the rear end of the bike. Of course the track will change tomorrow and we expect our riders’ needs will change too. It was also an important day for tyre choices.